The ALMAGIC Project (Contract No. 755515 of the Clean Sky 2 program) continues its journey. A new meeting was held to monitor the status of the project in the facilities of Delft University of Technology in Delft (Netherlands) last 22nd of November. The ALMAGIC Project led by CIDAUT and granted by the Clean Sky 2 programme (Contract No. 755515), held its second review meeting on 15-16th May 2018 at HENKEL´s premises in Düsseldorf (Germany). The progress of the project in the study of the substitution of hexavalent chromium in the aerospace materials by developing alternative conversion coatings for aluminium and magnesium was shown. Each partner exposed the results obtained and the next actions. All partners of the ALMAGIC, -Contract No. 755515 is a Clean Sky 2 funded Project-, gathered for reviewing the work done during the first six months. This meeting took place at Helmholtz facilities (Germany) on 16-17 November 2017. During the meeting a general revision of the status of the project was done. Each WP leader presented the work that had been developed, and any question or doubt was solved at the moment. Last September in San Sebastian, the Remaghic Project partners held the 24 month meeting general assembly. During the last months many decisions have been taken on the best chain of processes to recycle rare earths and on the design of the currently manufactured facility to recycle Mg and produce the Remaghic magnesium alloy. Currently, casting tests with different alloying elements have been done, corrosion and mechanical testing campaigns are ongoing, and the project faces the last project year where the industrial validation and the LCA will highlight the results achieved. The ALMAGIC consortium met in Munich last July 13-14th to kick-off the project. All partners gathered at “MTU Aereo Engines AG” facilities to present the working plan and the tasks to be carried out during the next 18 months. The REMAGHIC project continues its journey. On the 1st of February started the sixth month of work. Work packages 1 and 2, are in full swing, with the analysis of the main sources of waste, and at the same time preliminary work with the life-cycle assessment (WP5) has begun. All these tasks have been accompanied by the management and dissemination and communication works (WP6 and Wp7). 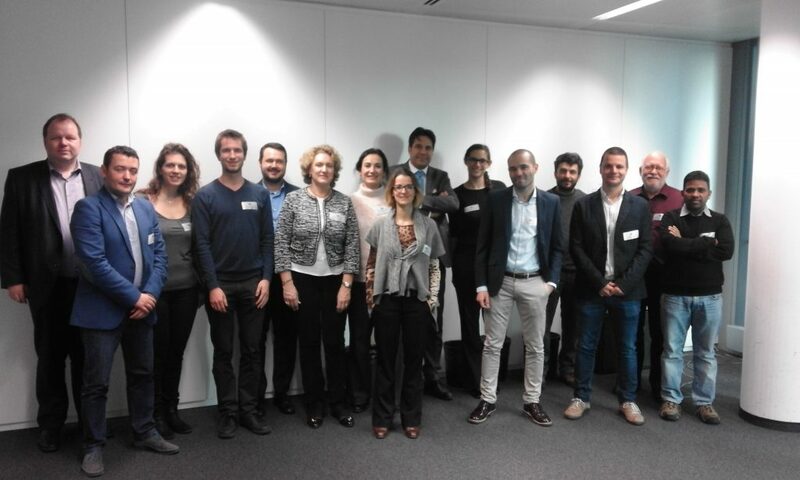 REMAGHIC project kick-off meeting held in Brussels. Last September 10th, the REMAGIHC consortium met in Brussels to kick-off the project. All partners gathered at Covenant Building, headquarters of DG RTD, to present the working plan and the tasks to be carried out during the first year of the project. Since October 2012, CIDAUT has been working in ALIVE project together with other 20 partners including 7 major carmakers, 7 major suppliers, 2 SME’s and 4 academia research centres. After more than 2 years of work, 21 partners have been developed materials and design concepts to obtain a high potential reduction of the weight of Electric Vehicles, while keeping track of the essential aim of affordable application to high volume productions. At the end of April, the EC officially communicated Cidaut the outcome of the evaluation for REMAGHIC proposal. It was favourably evaluated within the H2020 SPIRE-07-2015 call, and the grant preparation process started immediately. REMAGHIC, New Recovery Processes to produce Rare Earth-Magnesium Alloys of High Performance and Low Cost, aims at contributing to Europe’s rare earth recovery and magnesium recycling technologies, improving the efficiencies of these processes and advancing the technology readiness levels for a new generation of industrial processes that will produce new low cost competitive alloys for a wide variety of sectors across Europe’s manufacturing value chain.